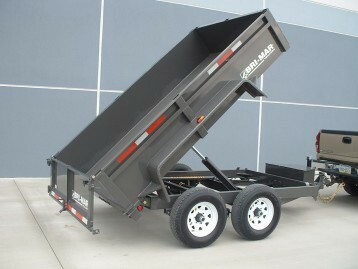 The R Series is a great entry level dump trailer for the homeowner, farmer or light duty landscaper. Great for mulch, yard cleanup and debris as well as smaller stone and dirt hauling jobs. A wonderful trailer that will be 'lighter' on your pocketbook. Designed for regular commercial work, the LE Series is built to get the job done...the right trailer at the right price...with available capacities starting at 7,000# GVWR through 14,000# GVWR. 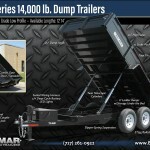 Our Bri-Mar LP Series dump trailers are designed for regular commercial work. The LP Series offers a 5x8, 6x10, 6x12 and 7x12 with available capacities starting at 5,000# GVWR through 12,000# GVWR. 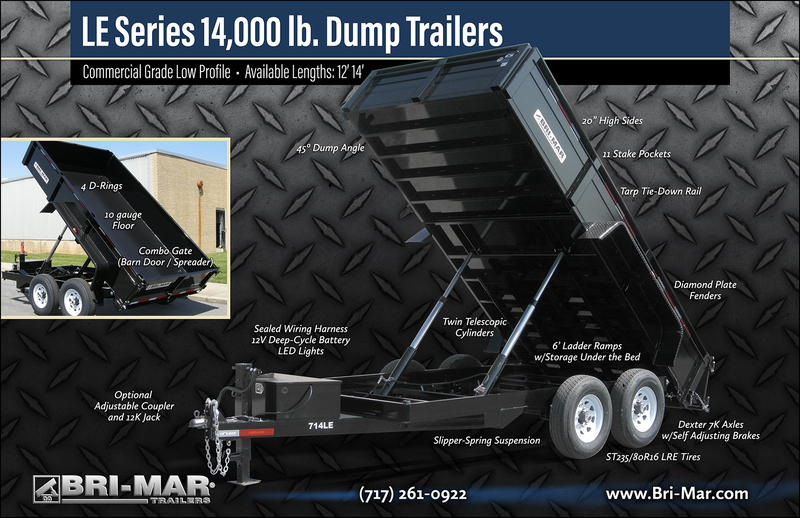 Available in 12', 14' and 16' models and built for the serious contractor, our LPHD Series dump trailers are ready for the toughest jobs. Need even more payload? 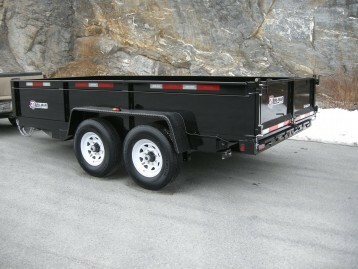 Check out the 16', tri-axle model with a GVWR of 21,000#. Need a little more ground clearance? 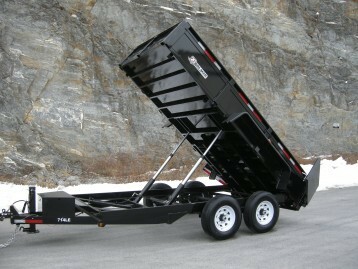 A solid performer, great for hauling firewood, mulch and other landscaping material, the DP Series deck over dump trailer is the right application for you. The EHLE Series is perfect for hauling light compact tractors, skid steers and similar equipment. The HDLS is designed for the serious landscaper with heavy duty split landscape ramps standard. For hauling heavier equipment, skid steers, tractors and just about anything on wheels, our EH Series equipment haulers range from 10,000 GVWR to 14,000 GVWR. Carry up to 11,000 payload on our 14-HD units. 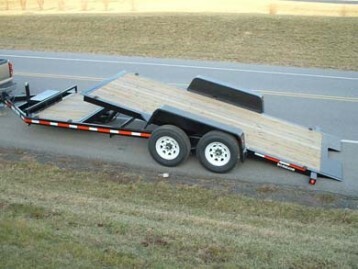 For equipment hauling needs exceeding 82" look to our EH8 Series deck over models. A 4' dovetail and 6' ramps make loading simple. Up to 16,000 lbs. payload on our 24' tri-axle model. 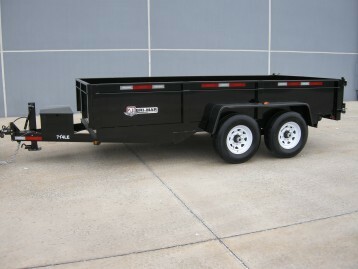 An affordable tilt trailer that saves your back. 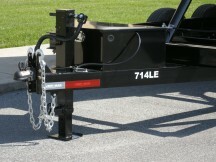 No more ramps to deal with, simply unlatch the deck and the bed tilts to the ground for a low 12 degree load angle. Our 14,000 GVWR power tilts give you 82" of deck width to load most any skid steer or small construction equipment. Heavy 6" tube frame construction, 14 degree load angle and over 10,000 lbs. of available payload. Race car, antique vehicle or just need to haul the family sedan somewhere, we have an economical open deck car hauler and several full steel deck models to choose from in our CH Series. Removable fenders are standard. 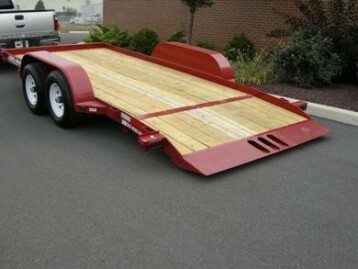 Make loading easier with our power CHT Series of tilt car haulers. 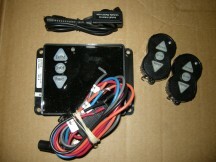 Winch plate and 4 recessed D Rings along with a full diamond plate deck are standard. 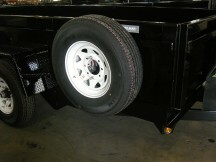 Remove either fender for easier vehicle access. Our UTE Series is the perfect fit for the price conscious buyer. 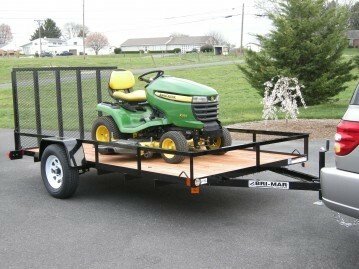 A well built angle frame trailer with the same quality components and craftsmanship as our heavier UT series but designed with the homeowner in mind. 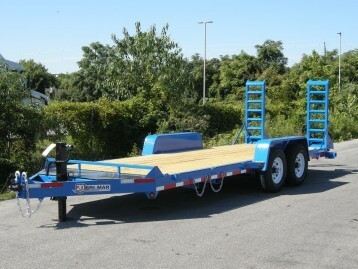 When the job demands a commercial grade utility trailer, consider the heavy construction of our tube rail UT series. Designed with the serious landscaper in mind. 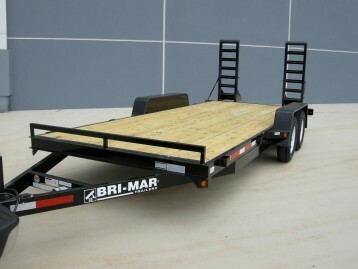 Bri-Mar LE Series dump trailers are designed for regular commercial work. The LE Series is built to get the job done.